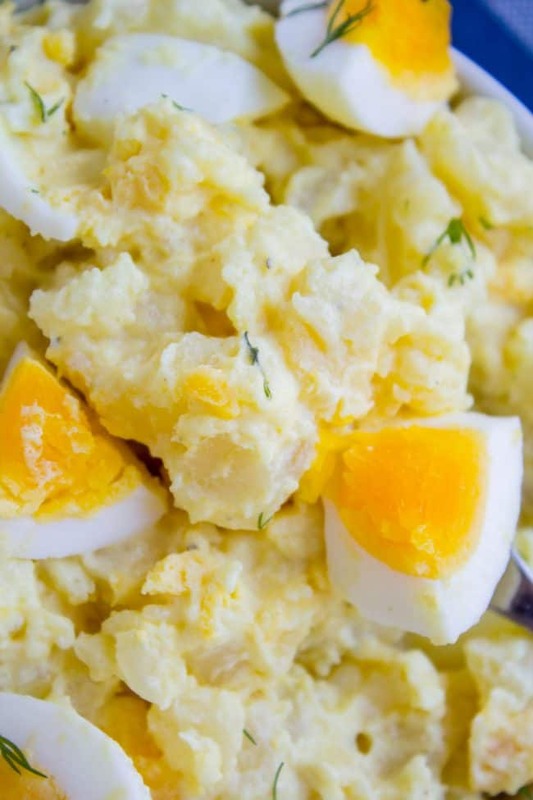 Everyone needs a great potato salad recipe! It’s a staple summer side dish. This one is my personal favorite. It’s easy to put together, and a great starting point to make the recipe your own. There are a few things that make it unique: boil the onions, add sugar, and use a cooling rack to get the perfect size potato chunks. Read on! Guys I thought I was over the whole candy thing. Like, don’t grown ups grow out of candy? Don’t we have better things to waste our calories on? But I’m powerless in the face of a road trip. We are heading to Colorado to get together for a reunion near Rio Grande National Forest. It’s a 2 day drive. That means 2 days of candy and cheese puffs. The thing I love best about Joy’s potato salad recipe is the lack of raw vegetables. Read: NO CRUNCHIES. I love the flavor that onions and other veggies add, but I’m just a stickler for texture when it comes to potato salad. Also, onion flavor is delicious, I just don’t like when it stays with me for days on end. So instead of adding raw onions, I boiled a chopped onion along with the potatoes. I swear by this method! It’s how my Aunt Shirley gets a ton of flavor in her Famous Creamy Mashed Potatoes. It works like a charm. 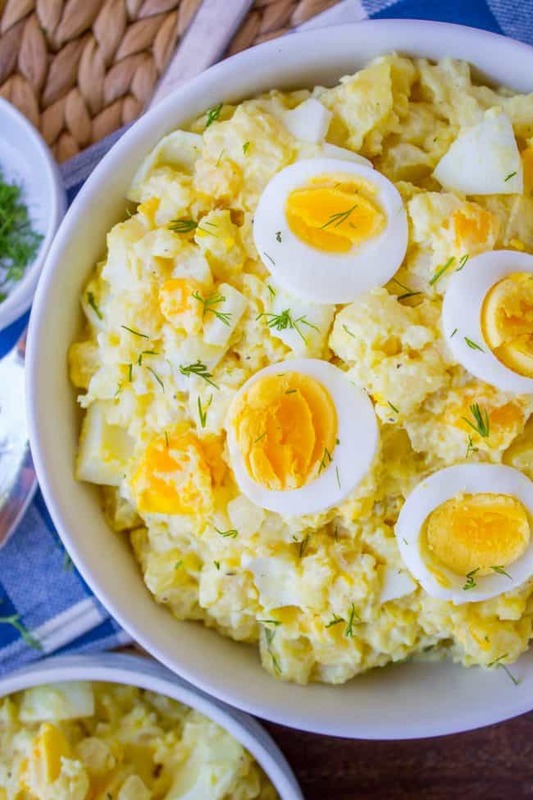 If you love crunchies in your potato salad, you can certainly add it in. Chopped pickles or pickle relish, raw yellow or green onions, chopped celery, etc. This is a great base recipe to work from. Here’s the next thing I love about this potato salad: the potatoes are the PERFECT size. Too often when I eat potato salad, the potato chunks are huge. Then your whole mouth is full of bland potato and no dressing. I like LOTS of dressing. Beautiful, mayonnaisey dressing. Here’s my secret. I roughly chop the potatoes, boil as usual, then…I push them through a wire cooling rack. Say whaaat? Yes, really. I know it sounds weird, but I swear, the texture and potato size in this potato salad is a GAME CHANGER! I learned about this method from a video about a restaurant called Sally Bell’s that we went to last year in Richmond, Virginia. Sally Bell’s is locally famous for their potato salad. The video showed them pushing boiled potatoes through a cooling rack and I was like THAT’S GENIUS. 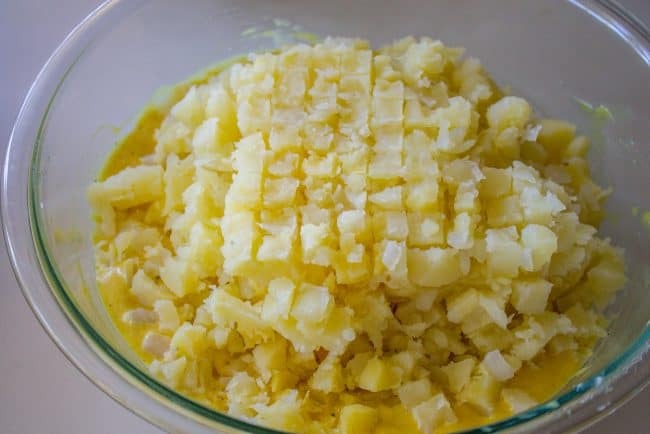 Who wants to spend forever chopping raw potatoes into perfect bite-sized chunks? My cooling rack has half inch squares. But I’m sure any cooling rack would give you the uniformity we’re going for. 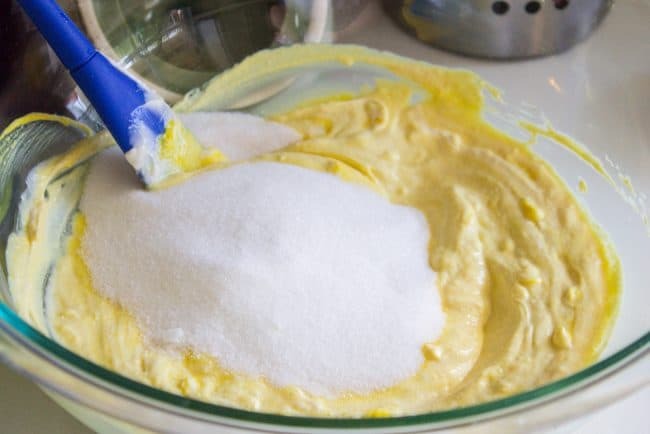 Here’s the next weird idea I’m about to blow your mind with: SUGAR. Wait, sugar in potato salad?? YES. Aunt Joy called for Miracle Whip in her recipe, but I didn’t have any when I tested this the first time. Miracle Whip is basically just mayonnaise with sugar in it, so I added the sugar myself. 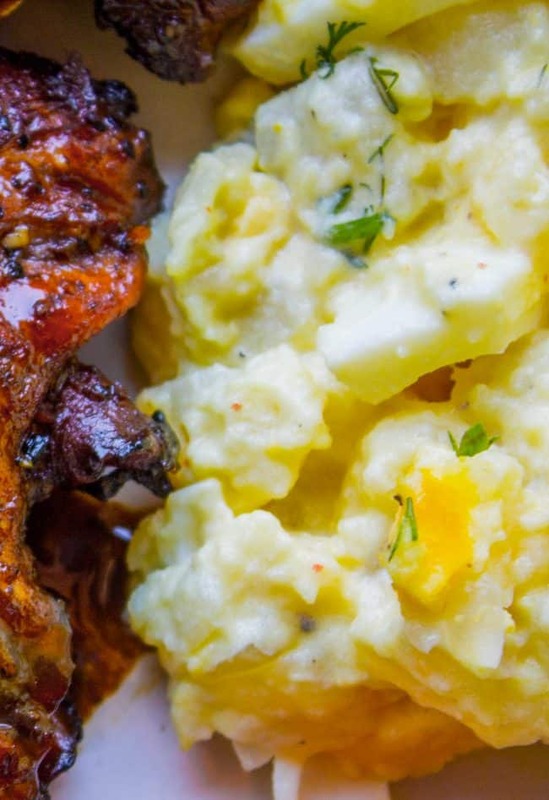 It really takes this potato salad to the next level. I promise it’s not weird. I was confident it would be delicious because I just made this macaroni salad a few weeks ago, and it also called for 1/2 cup of sugar. I’m in love. I took this potato salad to a family get together and we scraped the bowl clean. You should have seen the looks on their faces when I told them I put sugar in the potato salad. Totally shocked. There are 9 eggs in this salad. Now you don’t have to be “that person” who’s digging around for the goodies in the salad. I love to steam my eggs, it makes them so easy to peel. Just look at how creamy it is! Here’s one last tip: let your potato salad chill completely in the fridge, but then let it sit on the counter for about 30 minutes before serving. 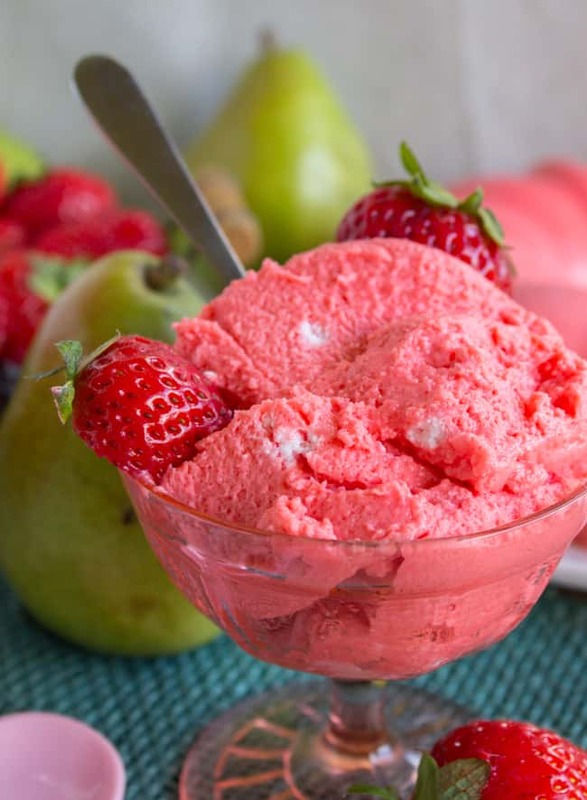 The flavors come through a lot better when it is not straight out of the fridge. It will still be cold, I promise. Just not ice cold. Trust me guys. And no, you’re not going to die of salmonella after a half hour. Chill, people. I made this potato salad with this Simply Amazing Grilled Chicken and grilled tomatoes. 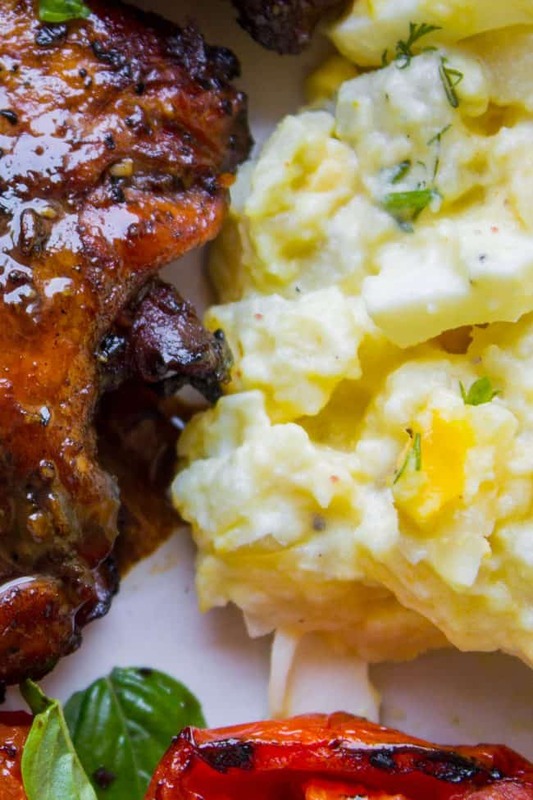 It would also be really good with these Honey Balsamic Slow Cooker Pork Ribs, or how about keeping it simple with The Best Hot Dog You Will Ever Eat? Or pair it with Smash Burgers! The possibilities are endless! 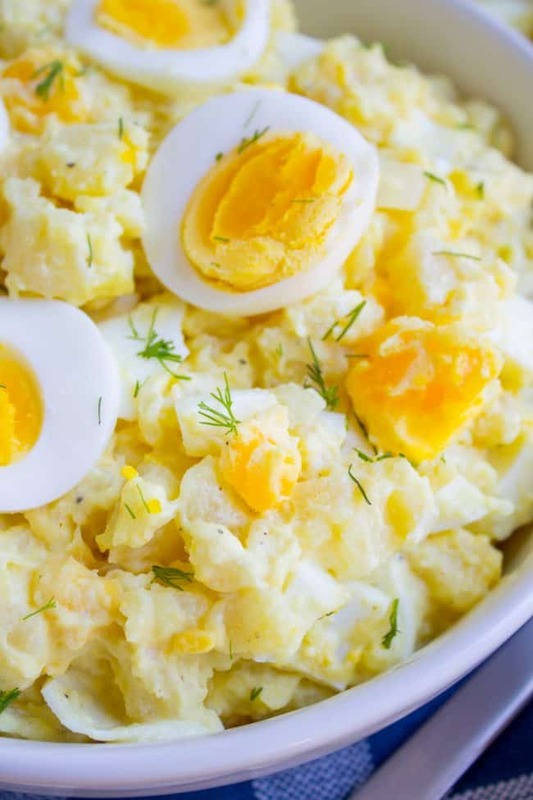 Everyone needs a great potato salad recipe! This one is my personal favorite. It's easy to put together, and a great starting point to make the recipe your own. There are a few things that make it unique: boil the onions, add sugar, and use a cooling rack to get the perfect potato chunks. Peel and chop the potatoes into 2 inch chunks. Chop the onion. Fill a large pot with water and add the potatoes and onions. Cover and bring to a boil over high heat. Once boiling, lower the heat to a steady simmer (you can tilt or remove the lid). Cook for 20-30 minutes, until the potatoes fall apart easily when you pierce them with a fork. Drain the potatoes, being careful not to lose the boiled onions. Return the potatoes to the dry pot and let cool for several minutes. Meanwhile, boil the eggs. I actually like to steam my eggs rather than boil them (it makes it so easy to peel), but you can do it however you like. I steam them in a basket over boiling water for 12 minutes, and then put them immediately into an ice bath. Boiling for about 8 minutes would give the same result. Make sure you do the ice bath so that they stop cooking. 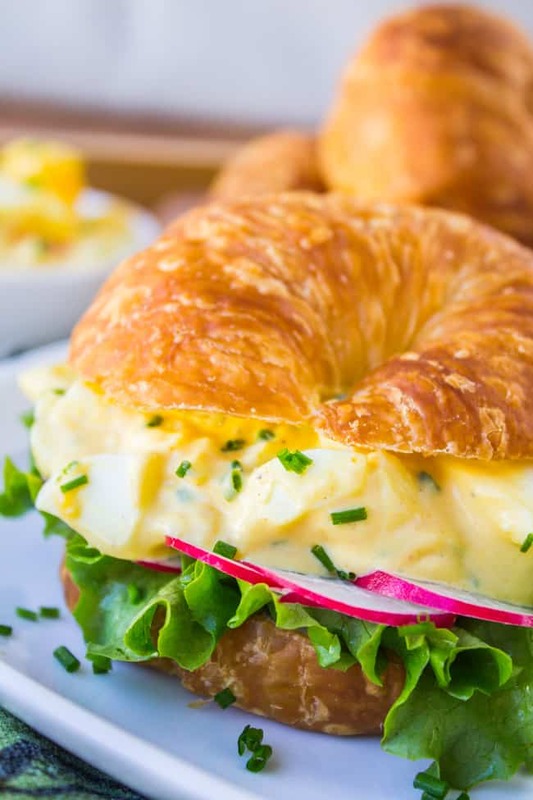 Peel the eggs and chop into bite size pieces. Meanwhile, in a large serving bowl combine mayonnaise, sugar, mustard, salt, pepper, and cayenne pepper. Taste the dressing and decide how much cayenne pepper you want to add. It's not meant to make it spicy, it's meant to add flavor. When the potatoes have cooled enough that you can handle them, place a wire cooling rack over the bowl with the dressing. My cooling rack has 1/2 inch squares, you can buy it here. Use your hands to push the boiled potatoes through the cooling rack into the bowl. Once you have pushed all the potatoes through, remove the rack. Add the chopped boiled eggs, and stir it all together. Cover and chill for at least 2-3 hours, or up to 24 hours. 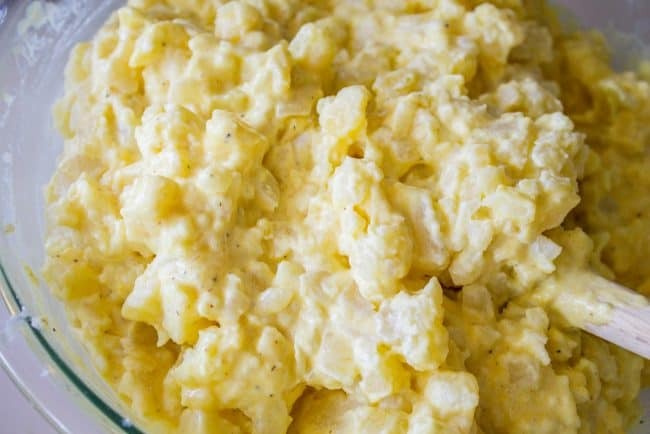 Let the bowl of potato salad sit on the counter at room temperature for about 30 minutes before serving. Sprinkle with fresh dill for an added bit of flavor! I love dill! Sea Foam Salad (Creamy Pear Jello) this is perfect for summer cook outs. 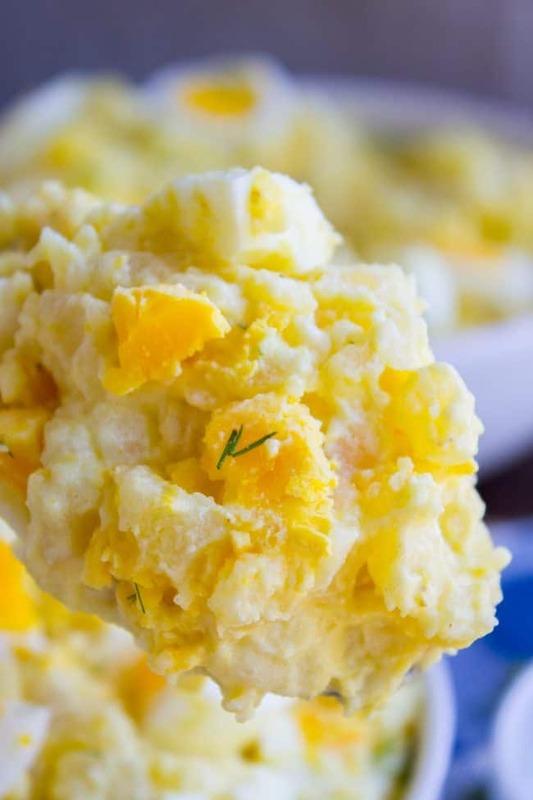 Potato Salad recipes from my food blogger friends! You will love it Alisha! So many fun tips in this post. Kinda like my Moms. Unfortunately I never got receipe before she passed. I know she put cucumbers, tomatoes, eggs, onions. She would boil potatoes with skin on. Peel while hot then used Marzettis dressing while potatoes still hot. It NEVER lasted long wherever she took. Wait! I DO have it. Dont know how much of what but that’s where tasting comes in..
I’m so glad you found your moms recipe Deb!! That is awesome. I’ve never seen tomatoes or cucumbers in a potato salad but it sounds delicious. I will have to try it out! Your potato salad tastes a lot like mine, but I had never cooked the onion. Love the cooked onion in it. I developed my recipe several years ago, because I had a favorite uncle who loved potato salad, but had difficulty chewing hunks of potatoes. So I got my meat grinder out & put everything through the grinder using a course blade . Problem solved, salad delicious. Of course I add sugar. If I’m in a hurry, I use Simply Potatoes mashed potatoes. Sorry this is so long. I’m not sorry Vickie, I love hearing from you! That is a good idea to use a meat grinder. I’ve heard of people using potato ricers too, but I like the chunks to be just a bit bigger than that. I’m so glad you added the sugar!! It’s so good. Thanks so much for stopping by to comment, I love it!